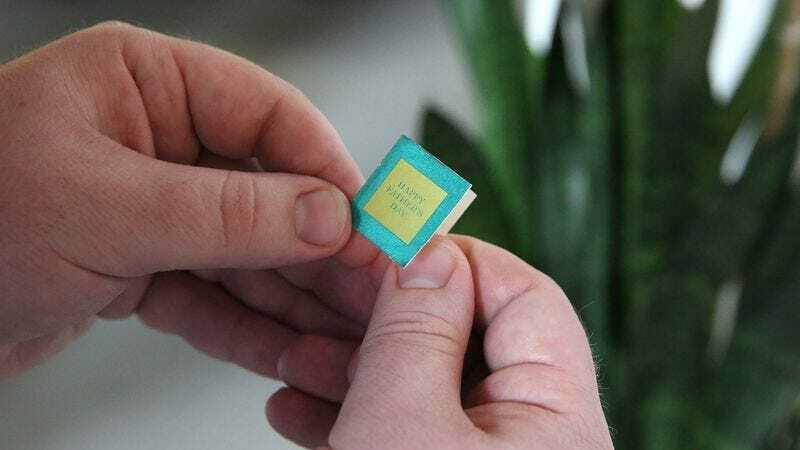 KANSAS CITY, MO—Touting it as the perfect way to celebrate Dad as quickly and efficiently as possible, Hallmark debuted a 1-square-inch Father’s Day card Friday that has no room for writing anything. “This new Father’s Day card is the ideal size for tersely addressing how much your dad means to you without having to add a single sentiment of your own,” said spokesman James Swickley, adding that the card simply has “Happy Father’s Day” written in a plain font on the cover, which succinctly recognizes the occasion without any unwanted embellishment whatsoever. “The inner panel is so small that you don’t have to worry about writing out a long, heartfelt message or making a weak attempt at lighthearted humor. There’s room to sign your name, but not even enough space to write ‘Love’ above that, sparing both you and Dad the awkwardness of an affectionate sign-off.” Swickley went on to say that Hallmark was working on an even more compact version of the card that was just the cover, aimed at fathers who’d figure out who sent it to them eventually.